On 3rd March, 2018 buyers will have the opportunity to view an exclusive collection of brand new apartments for sale at Ballymore’s premier East London riverside address, Goodluck Hope, located directly on the River Thames on the historic Leamouth Peninsula. The properties in this release include suites, one, two and three bedroom apartments, with prices starting from £392,500. The homes that will be available in this collection include suites, one two and three bedroom apartments ranging in size from 404 sq. ft. to 1359 sq. ft. making them ideal for young professionals and growing families. Designed by architects Allies and Morrison, each of the apartments offer open plan interiors, high ceilings and floor to ceiling windows that flood the rooms with light and provide striking views that take in the O2, Canary Wharf and City skyline. Maximising the prime riverside location, residents of Goodluck Hope are surrounded by water at every turn, with riverside promenades offering one-of-a-kind panoramic views across the capital. Paying homage to the industrial history, Ballymore have restored the entire structure of the Grade II listed Orchard Dry Dock that lies at the heart of the development, which will include elevated seating, making it a place to meet and socialise whilst enjoying spectacular views of the River Thames. Due to complete in 2020, Goodluck Hope will comprise of 804 homes across 3 buildings. The development offers buyers the rare opportunity to experience contemporary warehouse living within a culturally rich neighbourhood which includes Trinity Buoy Wharf, a thriving arts quarter located next to the development, which is home to the Royal Drawing School and London’s only lighthouse which hosts Jem Finer’s ‘Longplayer’, a musical composition, which has been composed to play in real-time, without repetition, for 1000 years. Ballymore is transforming the area, providing a wealth of lifestyle and leisure amenities including Ballymore’s own creation, The Island Grocer, an Italian inspired delicatessen and restaurant and The Wharf Brewing Co., an outpost of the Brick Brewery in Peckham, on the site of the old Orchard House pub, creating locally brewed beers alongside a brewing school for a first-hand experience of this craft. As part of the lifestyle at Goodluck Hope, all residents have access to The 1595 Club, a network of globally inspired amenities under one roof including a 24 hour concierge, swimming pool, steam room, fully equipped gym and business centre. Entertainment options include a private cinema, restaurant and on the 29th floor a spectacular viewing lounge on the top of the tallest building with panoramic views of the Capital. The development’s prime riverside location also makes it ideal for commuting to the City and Canary Wharf with the new MBNA Thames Clipper service due to run when residents move in, making the location even more accessible. 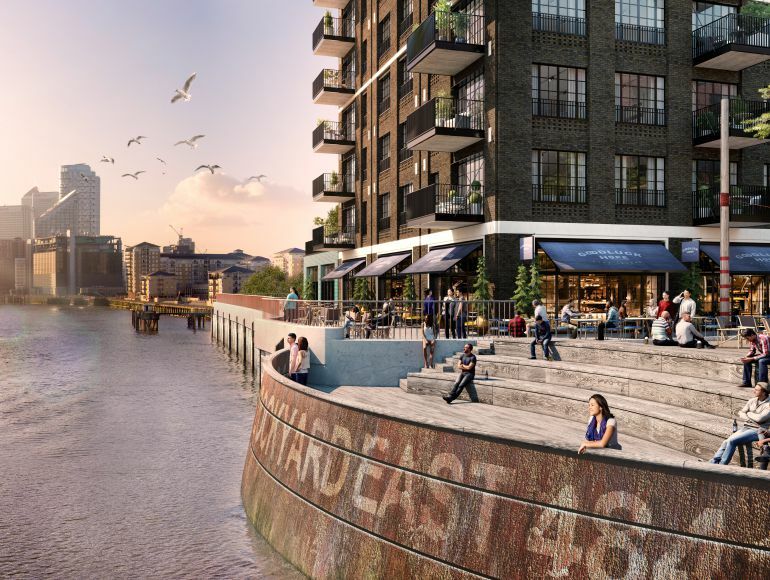 East London is currently undergoing a renaissance with regeneration masterplans transforming the skyline and the increasing desirability of being close to London’s main financial district. The average sold price in E14 has increased 11.79% over the last year (2016 -2017) . With the ongoing regeneration and improved infrastructure programme, Goodluck Hope represents a strong investment opportunity. For more information potential buyers can visit www.goodluckhope.com or contact Ballymore on 0207 637 0800. Ballymore is an international property development company with a reputation for innovative projects that push boundaries and energise cities. Led by its founder, Chairman and CEO Sean Mulryan, who formed the company in Ireland over 35 years ago, Ballymore believe in creating developments that improve, enrich and enhance people’s lives, with the scale of a heavyweight developer whilst retaining the integrity of a family business. Ballymore have an entirely new vision for every project they undertake, aiming to produce residential and commercial developments that set new standards in placemaking, construction, design and urban planning, with each development culturally led and drawing on the character and history of the neighbourhood in which it is found. Ballymore lead each project from conception through to delivery and they remain fully committed to their buildings, long after the last unit has been sold, through their estate management teams. Ballymore’s current development portfolio includes Royal Wharf, London City Island, Embassy Gardens, Wardian London, 161 Marsh Wall, Three Snowhill, Dublin Landings, West Hampstead Square, Providence Tower, Pipers Hill and Royal Canal Park.